There are quite a few prominent figures within the truth community who have helped awaken and motivate the people toward greater levels of awareness. These people responsibly cover a variety of genres and discuss numerous topics—each using their own means of acquiring, gleaning, and distributing information. Together, these figures contributes the priceless ingredient of diversity of subject to the ever-expanding collective of human consciousness. One of these figures is David Wilcock. Wilcock is one of the major contributors to my own awakening process and has taught me a great deal about the discipline of journalistic research. Perhaps one of the most exemplary aspects of his work is his discipline to thoroughly site and to cross-reference ever source he utilizes. This process allows audience members to check Wilcock's logical process and has resulted in numerous researchers independently coming to many of the same conclusions he has. Occasionally, some of the points which Wilcock makes are said to come from insider sources who for safety reasons. Though these sources cannot be completely verified at present, most of the disclosures David his discussed over the years have been supported (and sometimes proven) in numerous ways. Despite the occasional negativity which he has endured over the years of being in the public eye (along with a handful of smear attempts), Wilcock has still managed to provide notable points of research, and has helped thousands of people progress along their path of awakening. 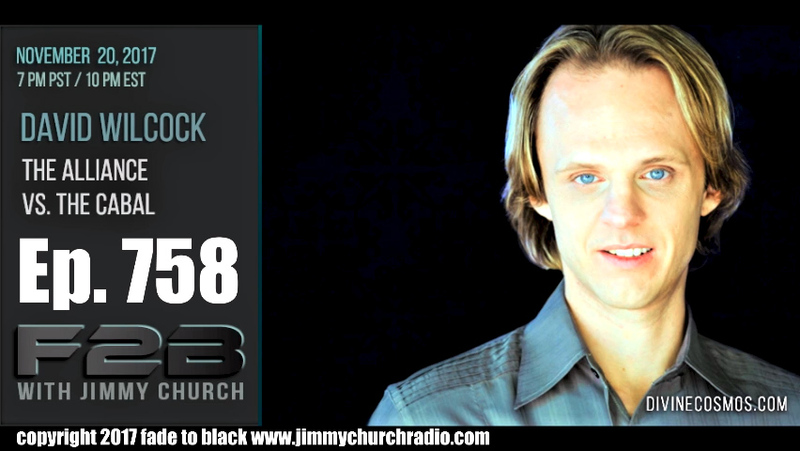 With that, here is Jimmy Church and David Wilcock on Fade to Black Radio. These interviews of notable researchers are always a treat to digest. They have a way of offering new challenges and possibilities to explore for our own process of discernment. More than anything though, they show the audience that it is possible to expand ourselves and our collective situation beyond our present perceptions and expectations. I always find it interesting to observe the Cabal making their attempts at public influence. Though these attempts are frequent, they appear to be having less and less of an influence over the people. It was especially interesting to observe this method being attempted through the Delonge disclosure. The classic telltale signs of Cabal manipulation were prevalent throughout the production, and these reminded me of similar tactics used in other instances as of late. For a good while now, I have observed the Cabal's formulated attempts at public manipulation. This method may have been effective at one point in time, but if it was, that effect appears to have dwindled significantly. It seems from these tactics that these cabalists are severely detached from humanity—so much so that they have forgotten how to communicate with the general public. Consider the numerous times that Cabal interests have attempted to use the celebrity fallacy in order to achieve their objective. I have honestly lost count of how many times the media has paraded celebrities in front of the public for the latest globalist/political agenda. These interests appear to have developed a formula for what they consider effective public influence. However, this formula does not appear to work in any case (to restate), and there are several reason as to why. For instance, when attempting to convince the public of the merits of their latest political agenda, the Cabal, instead of using notable and upstanding political figures, they use musicians and artists. Instead of defaulting to those who provably know what they are talking about, the Cabal uses celebrities such as Katy Perry, Eminem, Lady Gaga, Shia LaBeouf, Miley Cyrus, and many others. From this repeated method, it seems that the Cabal thinks the general public will listen to anyone with some type of following. Whether or not the figure is a musician, a singer, or wears clown shoes, the Cabal seems to believe that the loyalty of an audience is somehow unconditional and compulsory. Instead of realizing that we, the public, know the difference between entertainment and reality, the Cabal assumed that we will blindly believe everything entertainers say. Elitists seem to be so consumed with their own illusion of superiority, they fail to realize that no one else sees them as superior. Others see their flaws. We see their mistakes, their imperfections, and failures (along with various positive qualities, but those qualities are commonly overshadowed). We see their crimes and their impending punishments. These criminals are not at all perfect in our eyes. Nor are their celebrity puppets convincing toward any globalist, political agenda. It seems that these Cabal members perceive the masses as ignorant, dull, and incapable of detailed observation. This common assumption which the Cabal seems to make may be linked to their lowly view of the common people—a belief that is actually part of their religion. Consequently there is very little chance that the Cabal will relinquish their own false perception of superiority, but this may actually be a good thing. The hubris of the Cabal has provided some of the main opportunities to overthrow them. It has largely been their unwillingness to admit their own imperfections that has allowed the Alliance to make so much progress toward defeating. For instance, when John Podesta saved the most hideous content on his email server, he considered security to be unnecessary. Instead of taking measures to safeguard his email server, he basically used the word "password" as his password, leaving the door open for hackers to confiscate all the evidence they wanted. It has been this type of brazen disregard for their vulnerability that has led to the Cabal's downfall. And personally, I hope they continue making such errors. In general, it seems that Tom Delonge was selected not because of his genuine interest in UFOs and disclosure, but because of his popularity. This appears to be the same Cabal thought process at work as we have seen in the past. In choosing this same method of control as they have in the past, these elitists may have thought, "The people have approved of this celebrity in the past. Therefore, the people will listen to everything this person says and worship him the same way they did before." If this was their thought process, these elitists couldn't be more wrong. I would have to agree with David Wilcock in that the truth community does not blindly trust any random person who comes to them making proclamations. Considering the fact that Delonge had virtually nothing new to offer with regard to information, there has not been much of a reason to pay attention to his pseudo-disclosures. It appears that the only way to get through to the truth community is to be upfront and honest with the people. However, even then, some people will still reject presenters and/or accuse them of some heinous wrongdoing. Though blind accusation is not preferable, this is simply an aspect of the nature of the awakening process. Combine ignorance with fear and a lack of self-discipline, and such blind accusation will often result. However, this is easily remedied. As we may know, there are various stages of waking state. Most people may assume that there are only two states of consciousness we can occupy—those being completely asleep and completely awake. However, there are actually numerous levels of consciousness between these states. Think about the process we go through when we first wake up in the morning. Are we immediately ready to jump in the car and drive to work? For most of us, the answer is no. We have to gradually awaken to a level of consciousness that is conducive to the activity we intend to partake in. Whether we have a day of typing, driving a forklift, or phone conversations ahead of us, we are used to giving ourselves ample time to reach the level of waking state necessary to complete our tasks effectively. The same principle applies to consciousness awakening. When we first awaken, we are not immediately ready to determine and declare what truth is. Initially, we are confused, disoriented, and sometimes afraid. Many of us progress beyond this state, but some may choose to stagnate within it. When we manage to move forward from here, we begin to gain confidence within ourselves and embark upon our courageous search for true answers. There is also a learning curve to this search. When we accept the fact of our ignorance and our inability to immediately determine truth, we realize our need to be flexible in our thought process. This mental flexibility helps us to consider every possibility of reality so that we do not miss a probable truth. Flexibility also helps us avoid jumping to conclusions about the possibilities we are considering. In the interview, David Wilcock mentioned numerous possible reactions a person might have to the disclosures taking place. More specifically, he talked about his personal observations of these reactions from people he encounters online. Many of these responses exemplify the inability of certain audience members to handle new information responsibly. Some people jump to immediate conclusions out of fear of their own ignorance. In other words, when faced with a question, some people may simply fill in their mental blank with a random answer without caring how inaccurate that answer might be. People may do this due to their agnosiophobia, or the fear of not knowing. In other words, they jump to conclusions simply for the emotional security the answer gives them. Others may give up their search for answers out of self-defeat. Still some may avoid the search altogether. I find it very likely that the negative responses which David Wilcock discussed in the interview may have been triggered in audience members due to one or more of these causes. Responsible people will typically study what a source has to say, analyze and cross-reference the information for themselves, and keep the information in the back of their minds for future verification. This is a mature and responsible recourse. However, not all people will choose it and that is understandable. The awakening process can be different for every individual. There is not simply one path to follow on this journey. Though there is the general goal of ever-increasing enlightenment, this goal is achieved by way of countless paths with numerous possibilities along the way. As we explore these possibilities, it is always good to remember that it is our focus which determines our outcome. This is the collective experience which is driving the disclosure movement to ever-increasing levels of potential, and this process can contribute to our societal push for transparency and disclosure as a whole.